Enlisted in Company H, 1st Cavalry Regiment Massachusetts on 05 October 1861. John Beadle, sparmarker, 8 Peabody, h 17 Turner. 1850 Salem City Directory, Mrs. Lydia Osborn, nurse, house 17 Turner. John Beadle & Son, spar markers, rear 39 Derby, h 17 Turner. 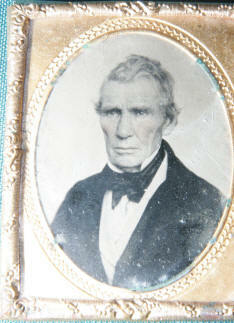 Jonathan Osborn, clerk, 179 Essex, house 17 Turner. 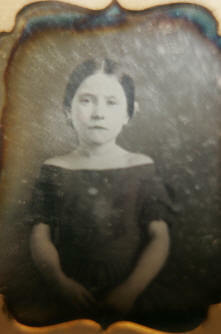 Mrs. Lydia Osborn, house 17 Turner. John Beadle, mast and spar maker, house 17 Turner. 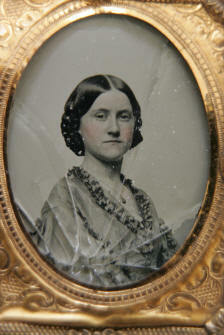 Lydia B. Osborn, widow of Jonathan, house 23 Hardy. Lydia B. Osborn, 23 Hardy. Mrs. Amanda M. Henville, dressmaker, 291 Essex, do. Amanda M. Henville, dressmaker, 24 Lynde. Amanda M. Henville, dressmaker, 36 Lynde. Jonathan Osborn, traveling salesman, h 180 Walnut. Jonathan Osborn, rem to Salem, Mass. Osborn, Ambrose L (Ethel M) traffic mgr 73 Washington h at Gales Ferry. Ambrose L. Osborn (Ethel M) traffic observing supr TelCo, h (B1) 10 Livingston. A wedding present for Belle Shaffer and George Osborn, done by George's grandmother, probably Amanda Ward Henville, because she is listed as a guest at their wedding.